The Cristo Rey Network is a not-for-profit organization to increase the number of schools modeled after Cristo Rey Jesuit High School in Chicago, which was founded in 1996 to prepare youth from low-income families for post-secondary educational opportunities. Motto: Transforming urban America; one student at the time. When Cristo Rey needed new inspiration, insight, and motivation to harness “network effects” from its loose confederation of schools, Carter Research was there to help. Guided senior management team to create a new school support model for its national network and the investor prospectus needed to fundraise for it. 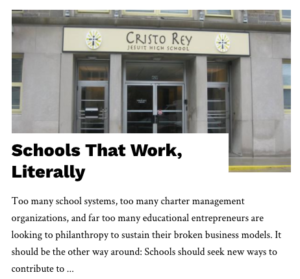 Developed national media campaign to increase public awareness, political support, and donor investment in Cristo Rey’s breakthrough model – see – the following article published on July 17, 2012 by The National Review. Massively replicating the successful practices of high-performing high-poverty schools still remains AN UNFULFILLED MANDATE since the NO EXCUSES research of 1998. Faith in the Future, Hope Christian and dozens of other private school networks like Cristo Rey make the case for private education as a public school option – but the policy and practice are not in place – why?